Moving your family to a small tropical island in the far Western North Pacific Ocean can be a bit stressful to put it mildly. Particularly if you're coming from a large metropolitan area and are accustomed to all the amenities that sort of lifestyle has to offer. Living on Guam is a bit different to say the least. We think you'll find after a short adjustment period you'll settle in and begin to enjoy our way of life here. At GuamPCS.com, we're here to make that transition period as easy as possible for you and your family. Our staff will work closely with you throughout the process. We go far beyond simply making reservations for you. We routinely exchange email and phone calls with our customers and their command sponsors for weeks, sometimes months, before they even get here. It's always nice to know someone where you're going. If you're coming from the U.S. mainland, you'll notice a big difference in the way people live. Things move a little slower on Guam, people just don't seem to be as hurried. Homes are not as lavish, cars not as luxurious, and everyday products you need and want aren't likely to be of the same type you'll find in the U.S. Mainland. Barbeques are very popular here on the weekends, and there is always someone having a fiesta for one reason or another. People just find a reason to party here. On Guam, people tend to pursue a more simple life focused on family and friends. The community is more closely knit than you're likely to find in the Mainland. Let yourself slow down a little and enjoy the experience of a new way of living. Guam has a unique culture and its traditions and customs have thrived throughout history, despite invading conquerors, wars and changing governments. It has since expanded into a vibrant, modern way of life, retaining its cultural identity, language, customs and cuisine. The people of Guam, known as Chamorros are a very happy, friendly people and there is nothing they like more than a festival! The Spanish heritage is still very much evident today, with each of the 19 villages having its own patron saint whose feast day is celebrated with an elaborate fiesta usually continuing throughout the week, with an array of local delicacies, music and good cheer. Everyone is welcome to participate. Over the years, visitors such as the Americans, Europeans, Asians and Micronesians have left their imprints on the island's pastimes and tastes, and particularly in the island's food. During one of the many fiestas or family parties you will find tables laden with local delicacies, such as red rice, shrimp patties, Filipino style noodles, barbecued ribs and chicken, and taro leaves cooked in coconut milk. The traditional menu also includes such favorites as Eskabeche (fresh fish marinated in vinegar and soy sauce), Kadon Octopus (octopus stewed in coconut milk with onions and sweet peppers),) and Shrimp Kelaguen (minced shrimp mixed with lemon, onions, peppers and shredded coconut). To get a real flavor of local food take a trip to the Chamorro Village Wednesday Night Market at Agana. Here you will find vendors selling wonderful Chamorro treats such as Ahu (grated coconut boiled in sugar water) or Lumpia (vegetable egg roll dipped in garlic sauce) and homemade Sweet Tuba (a drink made from the first sap of the young coconut tree). A firm favorite with families are the operated barbecue booths, where you can sample Short Ribs, Chicken Kebobs and even squid are served hot off the grill. Music plays a significant role in island lifestyle and singing is a very important element of Guamian music. The Kantan Chamorro style of singing is a type of improvised poetry and has been a favorite form of entertainment for generations. Traditionally it was used to lighten long hours of group work activity, begun by one singer who would sing the familiar four-line chant, trading witty remarks with another group worker. This person would then take up the tune and the song might continue back and forth in this way for hours. Music performances can be heard using traditional instruments, such as the belembaotuyan, made from a hollow gourd and strung with a taut wire, creating a melodic sound. Another popular traditional instrument is the Kantan, which is a nose flute made from bamboo and originally used by men to serenade their sweethearts. Guam has a lot of legends that some local people still believe today. Legends and folklore from doomed lovers leaping to their death off Two Lovers' Point to the legend of the coconut are portrayed in many of Guam's cultural dances. A great place to learn more about the legends of Guam is http://ns.gov.gu/legends.html – run by the University of Guam. Guam's traditional arts and crafts are very much alive and visitors often have the opportunity to watch master craftsman such as weavers and blacksmith at work during cultural fairs, exhibitions and at Chamorro Village. To view exhibits by local and regional artists visit the Isla Center for the Arts at the University of Guam or the KAHA Arts & Culture Gallery at Two Lover's Point. A great place to experience and discover the people and culture of Guam is to visit Chamorro Village, Hagåtna, next to Agana Marina. The best time to visit is the Wednesday night market when you can enjoy a lively night of free entertainment with local live bands playing anything from local folk songs to rock and watch live demonstrations by master crafters. This is also an excellent place to shop for traditional arts and crafts or to buy local plants, fish and other fresh produce. Open Mon-Fri 8am-5pm and Sat 8am-1pm, Wednesday evenings from 6-8pm. Classified ads, tourist info and contact numbers. Travel, shopping, and cultural event info. Shopping for some items you've grown accustomed to in the Mainland can sometimes be a challenge. If you have access to the military bases you're ahead of the game. Prices on base are at least 20% below what you'll find on the outside, including gas. And with bases at each "end" of the island, it's not difficult to make the trip. Each of our bases has different things to offer. We also have a couple of big retailers on the island like K-Mart and Macy's. Otherwise, there are tons of shops lining the sides of Marine Corps Drive and "mom and pop" stores in every neighborhood. Another option to find things you need is to buy from the internet. One problem you'll experience when shopping on line is shipping options. 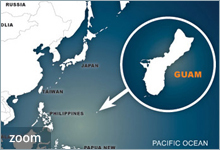 You may find Guam (abbreviated GU) isn't in the menu of U.S. States. 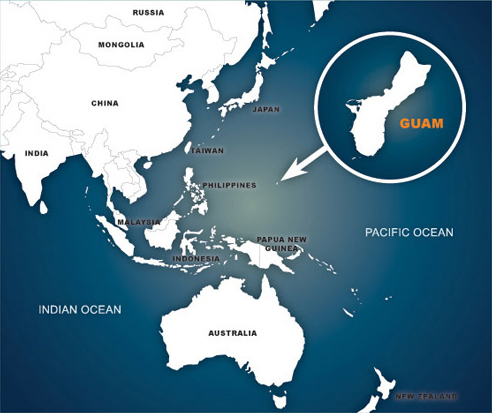 Internet shopping tip: When shopping on the internet sometimes when entering shipping information, you'll find Guam (abbreviated GU) isn't in the menu of U.S. States. When this happens, try the drop down menu for "countries," sometimes you'll find Guam there. Otherwise, you may have to make a phone call and arrange shipping. Another option is to have the item shipped to a friend stateside and have them forward it to you. Generally U.S. Priority mail takes about 10 days to get from the continental U.S. to Guam. MCV Broadband is the island's largest entertainment service providers. With services like internet, digital cable, home phone, cell phone and home security systems. MCV Broadband Online offers multiple Internet speed options to suit your specific needs. The Internet speed you choose can be connected to one computer in your home via a cable modem. Surf and download huge files at blazing-fast speed, plus a dependable connection that's always on! MCV Broadband Online doesn't require a phone line, so you'll never get a busy signal, and you can surf the internet while you talk on the phone. Long distance service here offers a few options. You may choose to go with our one-and-only local phone company's rates, or pick up long distance calling cards at just about any gas station or convenience store. Money Saving Tip: Use internet based instant messenger services such as Yahoo or MSN. They're free and you can talk to your family anywhere in the world in real time using a headset and an inexpensive webcam. Yahoo Messenger also offers very good rates on long distance web-phone calls. Money Saving Tip: Bring your state side cellular phone(s) with you. Some are able to be reprogrammed to work on one of Guam's networks. We have several local cellular service providers on the island to choose from. Contrary to what the big stateside carriers will tell you, their service will most likely not work here. While in some cases your phone can be reprogrammed to work with our carriers, you'll want to establish a local account soon after your arrival. The good news on Guam cellular services is that recently competition has heated up and residents of Guam finally have a choice. It's now possible to get service comparable to what you have stateside here on our tiny island. Some plans even include free long distance to the states. The main players in the market are GTA and Guamcell. An additional carrier, I-Connect, offers a service similar to that of Stateside Nextel users with the raido feature that has become so popular. I-Connect's voice plans, however, leave something to be desired for heavy users. Check out the current rate plans for the different carries on their websites. The two main ingredients of modern existence, internet access and cellular phone service, aren't missing on Guam. Over the past few years, Guam has been catching up with advancing technology and there have been big improvements in the services offered to Guam's residents. As the technology is constantly evolving, please check each company's individual websites for details about their services and prices. Docomo Pacific (formerly Guamcell) and ITE both offer 56k dialup services and DSL in addition to their cellular phone packages. GTA offers customers home, cellular, internet service as well as digital TV packages. MCV Broadband offers digital internet services with speeds up to 10,000 kps. Also provided are analog, digital, and HD channel options, as well as home phone and cell phone bundle packages to save you money. Wireless internet is available at a number of locations on Guam. Nearly all coffee shops on island offer free wireless internet for their customers (most notably at all Coffee Beanery locations). Also, wireless internet by IT&E is available at all Shirley's Coffee Shops, however, fees do apply. Some days are utterly beautiful, while others are a bit "damp." Guam has two seasons, dry and rainy. It rains during both, but far more during the latter. Although clear distinctions can't be drawn from dates, usually in December the rainy season will let up until sometime around May or June. All the other months are the more rainy season. The early part of the "dry" season is usually the mildest time of year, with nice breezes blowing off the water. Keep a couple small hand towels in your car. Keep umbrellas handy. In your car, in your desk, briefcase, purse, etc. You can't have too many. Rainy season = typhoon season. Preparing your family for a major typhoon is a must. 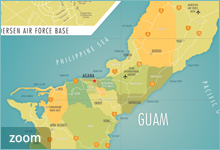 Visit the Guam Office of Civil Defense and Homeland Security Website. They've provided plenty of information on preparing for a typhoon. Be aware that typhoons can strike at any time of the year. Plan outdoor activities for the morning or late afternoon to avoid the hottest part of the day. Get your car windows tinted as soon as possible. Military bases require a lighter tint on the driver's & front passenger's windows. The other windows can be as dark as you want them. All reputable shops on island know the rules, but make sure to let them know your vehicle will be going on the military installations. Windshield sunscreens are a must here. Dehumidifiers in your home keep it comfortable and make it seem cooler. Don't underestimate the effects of heat on your body. Drink extra water whether you think you need it or not. Guam's traffic laws mirror that of the U.S. Mainland. Traffic signals and general rules of the road are the same. You will notice that people tend to make U-turns just about anywhere, and you may hear Guam's stop signs and lights referred to as . "mere suggestions" by some. Just drive cautiously and with courtesy. Be sure to follow the links from our "helpful links" page to Guam's Department of Motor Vehicles. Military members are not required to obtain their Guam Driver's license, assuming they have a valid license from another state. Family members must obtain a Guam Driver's License within 30 days of arrival. Click here to view more information on obtaining your Guam driver's license. Tip: One of the best sources for maps of Guam can be found in our local phone books. Here's a list of helpful links to provide you with current information you can use during your transition as well as general information about Guam. We're constantly searching for new sites so our customers have the most up to date information, so check back often for new links. If there's something you need to know that you can't find here, we're only an email away! Need a phone number on Guam? If you can't find it here, just ask us! Pacific Daily News has a special Navy section "Navigator" online. Pacific Daily News has a special Air Force section "Pacific Edge" online. Pacific Daily News has a periodical military magazine online. Even though Guam is a small island, only about 212 square miles, you'll probably never run out of things to do. Guam is a major tourist destination for Japan and other Asian countries, so here we're geared up to keep you busy during your off duty time. Whether you're a avid outdoorsman or prefer indoor recreation, Guam has plenty to offer. Guam's scuba diving is world class. The waters maintain a temperature in the mid-80's all year round. Visibility goes from great to exceptional depending on your dive site and the weather conditions. Whether you're interested in seeing the underwater flora and fauna, or are more intrigued by the mystery of a WWII shipwreck, Guam has it all. There is diver training available for the beginner through the most advanced technical diver ratings. Check out our friends at Guam Tropical Dive Station, at www.gtds.com. There are plenty of jungle trails to explore on Guam. Just don't be surprised if you stumble across a WWII era Japanese tank, and American landing craft, or a crashed Cosair while you're out there. Guam's Department of Parks and Recreation sponsors weekly "boonie stomps" which are led by experienced guides. Check out their website at http://www.visitguam.org/Runtime/JuneStomping.aspx. If you are golf lover you will love golf on Guam! Listed below are some of the more well known courses on the island. Mangilao Golf Club - is easily the most beautiful course on the island. Located on the eastern coastline of the island it offers an unforgettable challenge to players of all skill levels. It was designed by world renowned Nelson and Wright Golf Course Architects from Hawaii. Talofofo Golf Resort - offers some spectacular views and was designed by 9 Senior US Professional Golfers - Sam Snead, Chi Chi Rodriguez, Gene Sarazen, Billy Casper, Doug Ford, Gene Littler, Orville Moody, Bob Toski, and Ben Hogan. Windward Hills Country Club - is the oldest course on Guam having opened in 1951. It was constructed as a family course so it can be enjoyed by all groups, ages and skill levels. Admiral Nimitz & AAFB courses. Guam is the perfect base-camp for trips to other parts of Asia. We're close to many exotic islands most people only get to visit on the Discovery Channel. Palau, Yap, Truk, the Marshal Islands, the Philippines (over 7,000 islands to explore there) and the list goes on. You'll have to worry more about your leave balance than running out of things to do. Check out Continental Micronesia's local office for special weekend getaway rates.